Berthed between Rose’s Marine, where the work is presently going on, and Frank Elliott’s new Gloucester Cruise Terminal has been quite an exciting time for Adventure and her crew of volunteers and shipwrights. As work goes on with the historic restoration of Adventure, new modern day cruise ships and their passengers and crews have been able to view our progress during their fall visits. Visitors have been thoroughly impressed with what our team is doing and have been very supportive of our undertakings. “This is not something you see anywhere else” has been uttered relentlessly by our port visitors. They are absolutely correct. Work has been progressing at a good pace during the past several months on Adventure’s restoration. The forward hatch to the foc’sle has been installed and looks stunning. Hermann Hinrichsen has been building many components in his southern New England shop and transporting them back to Gloucester in order to expedite the restoration process. We have two crews, one in Gloucester and one in southern New England, working on projects that are needed during this phase of the restoration. The forward fish hold and deck hatch area also framed and installed. Back on the main and quarterdeck, Adventure’s main fish hold has been framed up and installed. The lift out deck section for the engine compartment is in process and will soon be finished. The captain’s cabin or main trunk is being built to the exact measurements as her old cabin that was previously removed. All of her original internal cabin panels are mounted and ready to be installed when the outer frame and cabin top have been completed. New white pine decking has been installed to about sixty percent of the area of her main deck. Deck planks have been installed from the center of the hull extending outwards to her scuppers. It is quite a sight to see her new hatches and decking being installed. Harold Burnham is once again back working on Adventure with several of his team under Hermann’s direction. This has proved to be a very effective partnership that has produced very positive results for Adventure’s restoration efforts. We have been able to complete multiple tasks and separate work assignments with very good results. Adventure is so very fortunate to have a solid team of shipwrights….thanks to each and all for your work, ideas and efforts. Thanks to Joe Novello and Rose’s for their assistance in meeting our shore power needs. Work tasks became much easier with our newly installed power distribution. Under Joanne Souza’s direction a team of high school students and their instructors from Merrimack Vocational have been working weekly on projects such as building and installing mast cover frames, installing signs and posts and helping to cover Adventure for the winter work that will be completed. Thanks to each of them for their efforts and assistance. Adventure’s crew of volunteers are steadily moving forward and continue to meet the demands and time schedules required as her restoration efforts continue. A new, heavy duty, winter roof cover was installed over her entire stern section. Yes, on a weekend with 20 to 30 mph winds including high seas that made the task a tad more difficult. Side panels and plastic covers were installed and buttoned down for the winter. Clean ups and other associated tasks continue on a weekly basis. Thanks to all Adventure volunteers for your continued efforts and support. Well, this has been another exciting year for Adventure. Progress with the restoration, funding grants achieved, new board members added, plans for the future developed, things to do and places to go in the future. As the 2006 year ends and we enter into another new one….we….from the schooner Adventure wish to thank all who supported our efforts during 2006....each and every one of you. Have a wonderful holiday season and a great 2007!!!!! Well, we have endured another typical New England winter with arctic cold, frigid rain, severe high tides and just a tad of ice and snow thrown in to make working conditions even more difficult. We lost about five weeks of work due to the extreme weather conditions during the past four months. "Improvise" has been the work word used to keep things rolling along on the project. Laminating frames and decking with the assistance of heat lamps and portable heaters has kept us moving slowly forward. Even with the new age chemicals...they don't work unless a certain temperature range is reached. Spring is here and the results show that we have endured pretty well. All deck structures are framed and in place. Fish holds, companion hatches and main trunk are in place and only have a few weeks of work left on them until their completion. The main trunk has been fully rebuilt and reframed to the exact dimensions of her old cabin trunk complete with housings structures. Caulking will soon take place to seal up the newly installed white pine decking on the top of the trunk. The joinery on this structure is exceptional and worth taking a close look at before it is painted. Just an outstanding piece of work and a credit to Adventure's talented shipwrights. Adventure's main quarterdeck is approximately eighty percent complete. Her newly installed pine decking and frames will support her for another lifetime when completed. One of the problems we consistently face is the lack of quality timber resources. Not too many mills cut quarter-sawn lumber today especially on the east coast and with the slim availability of clear pine it makes our restoration efforts even more complex. We needed 2000 linear feet of quarter-sawn decking and Viking Lumber from Maine came through for us with some spectacular wood and actually was shown how it needed to be cut by our lead shipwright Hermann who took the trip to Maine to the mill. Thanks to Dave Flanagan and crew for their efforts, the cut wood, in lengths of up to twenty-six feet, is now on the way to a kiln in Vermont to be dried and readied for delivery to Gloucester within forty-five days. A lot of effort goes on behind the scenes at all times to make a quality project happen and it often goes on without being noticed. This is how things are and how it goes with a project such as Adventure. We always seek the highest level of quality in all of our restoration efforts and the results have been showing it. She looks great!!! Six new knees have been installed below decks for support. Knees are ninety degree pieces of oak that support the deck and tie things together. New covering boards are being installed on Adventure's port and starboard sides. This is a difficult task as all chain plates need to be removed and reinstalled after new covering boards are installed. As with every task, it is done with painstaking accuracy and quality. It needs to be done right. A new wheel house made in Tiverton by Hermann was delivered recently and will be installed once her decking has been completed over the rudder box and rudder post. Starboard side stanchions are being raised to match the height of her port side stanchions through a series of scarf joints. During the past month more rot on four old stanchions and a twenty-two foot strake were found during tear out. They will be replaced with new material to an exact match of the old work. New scupper strakes will be installed once the covering boards have been completed. New starboard rails will be made and installed to match her port rail height. Both sides will be cut in to her stern transom. 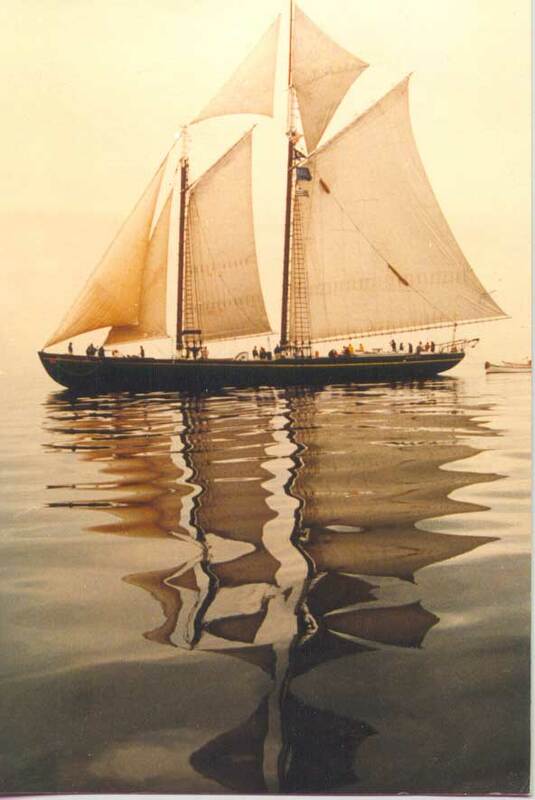 Gallant rails will be fashioned and installed and her stern and transom will be configured in the typical Gloucester schooner hourglass fashion. She will certainly look like a proud lady of the sea once finished. Once we receive our load of new pine from the kiln we will proceed to cut and install the twenty percent of the deck that remains to be completed within the next several months. It will be exciting to see Adventure's hull fully restored and once again made seaworthy. Caulking and pitching of her entire main/quarterdeck will take place once all decking has been installed. We have a team of great caulkers lined up to complete this task when we are ready. Lots of projects and tasks remain to be completed. Our intent is to move forward and get Adventure sailing again in short order. Masts will be reinstalled. Standing rigging will be refitted and installed. More wood work will need to be done inside her hull for bulkheads, galley structures, fish hold rebuild and a rebuild of her internal captain's quarters using her original panels. Ballast and an engine will need to be purchased or donated and then installed. Sails have been quoted and will need to be made. Safety equipment and Coast Guard readiness will have to be managed and integrated into our plan. Wireless systems will need to be built into her for educational programs. Gray and clear water systems as well as fuel and fire control systems need to be installed. We've got a lot to do and need your help. We are looking for volunteers, donations, new members, equipment and funding that will see Adventure through to make her a part of our Gloucester heritage. Come on down to see Adventure...she is berthed between Rose's and the new Cruiseport Gloucester Terminal on Rowe's Square. Come see what you can be a part of as we move into the future and ready Adventure to be an active part of Gloucester's waterfront history...fully restored as a 1926 fisherman. And a special thanks to our shipwights, volunteers, board members, businesses, City of Gloucester, community and our members for supporting our efforts. Schooner Adventure's Restoration Progress Report: Hull Completed! What's next? We have finally reached our goal of completing the restoration of Adventure's hull. Now onto the next step, which is to get her Coast Guard approved and then fitted out with an engine and a new suit of sails. We are excited that Adventure's new sails, funded by a generous grant from a local charitable foundation, will be made by world-renowned sailmaker, Nathaniel Wilson, of East Boothbay, Maine. Nat has constructed sails for a large number of historical vessels, including the Godspeed, the schooner Stephen Taber, and the U.S.S. Constitution. As of the last Saturday in November, members of the Vessel Crew removed thirty full barrels of salt water ballast from Adventure's bilge, which were drained and moved onto the pier. Another 110 empty barrels were also moved off the boat. After Adventure's ballast was removed, the Vessel Crew took the lines for her hull plan. The original plans were marked up the new data, which will be sent to our marine architect in California. Thirty barrels went back into the bilge to be filled and the other 110 were moved back onto the deck and will be refilled later. What a work out...felt good though. Water temp was in low to mid 40's....cold on the hands and arms up to the elbows. It was a good work day....worked hard....sun shining....cold was not bad 33 degrees and not a lot of wind. Another task done. any dimensions? Fore gaff rigged? What style main?